A mother duck was trying to shepherd her six babies across the road, but she'd chosen the wrong road to cross. Yesterday, the duck family got stuck in traffic halfway across Interstate 5 (I5) in Washington state. Cars swerved around the family as they sped along the congested four-lane highway, barely missing them. If they stayed on the highway, they were going to get hit. Thankfully, someone spotted the duck family, and called the Washington State Patrol for assistance. Matt Rogers was one of the officers who arrived at the scene. 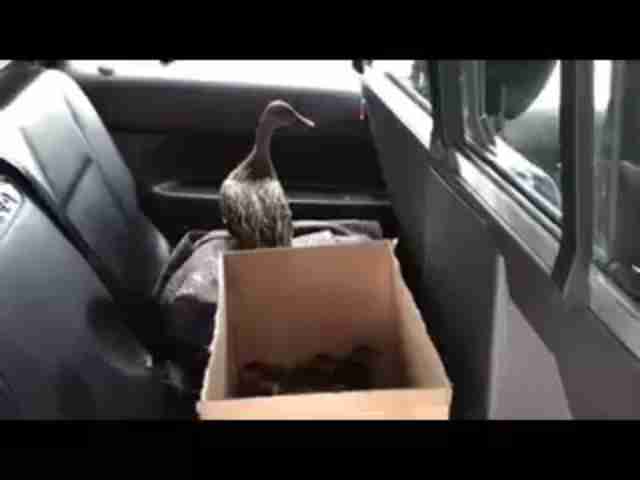 Rogers quickly caught the mother duck and five of the ducklings, and put them in a cardboard box in the back of his patrol car. But one duckling decided to do things differently. "One of the ducklings they were trying to catch actually ran across all four lanes of I5," Travis Shearer, a public information officer for the Washington State Patrol, told The Dodo. "But miraculously, the little duckling was not hit." Rogers risked his own life by chasing after the runaway duckling. When he finally caught him, he scooped him up and put him in a box with the others. Then he drove the duck family to a pond that was far away from the highway. 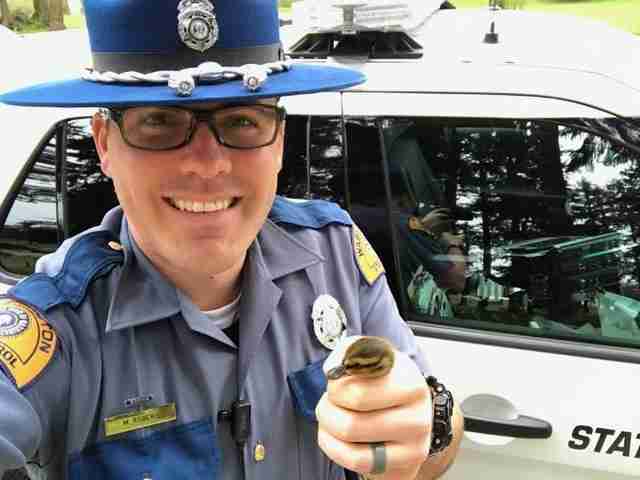 This isn't the first time troopers have had to help ducklings cross this interstate, and this certainly won't be the last, Shearer said. "For as long as I've been a trooper working this area, it's a very common occurrence," Shearer said. "When the wild ducks are hatching, we get quite a few calls in the region. We do our best to scoop them up and relocate them safely off the freeway." While no one really knows what the ducks were thinking throughout this ordeal, they're probably grateful to be alive - and to have stayed together as a family.